Search of dusty archives and abandoned libraries have uncovered the Forgotten Treasures of Ageless Wisdom presented in this special collection. These works are a reminder of the Golden Nuggets of Inspiration and Long Established Truths upon which success is achieved. Few can argue that the greatest power we have is the power of our thoughts, for it is there influence on our intelligence that elevates our life to the highest level. 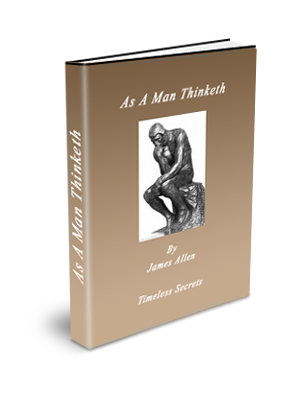 James Allen's classic self-help book, As a Man Thinketh, published in 1902 has literally been read by millions of people the world over. There are very few manuscripts which have stood the test of time and continue to provide a profound impact on generations of readers. 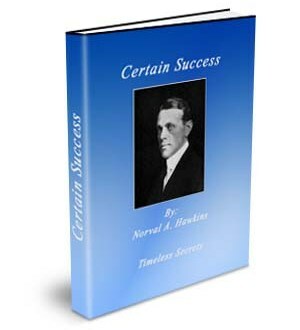 Norval A. Hawkins covers every single aspect of how to be successful at selling. There is no other book like this that gives as much qualified information. "Probably the most detailed book on success stragety that you will ever find." Norval A. Hawkins was a true master and sales wizard. Despite poor global economic conditions, Hawkins' leadership brought about massive growth for the Ford Motor Company more than quadrupling their car sales. He was also the first to devise the branch assembly plant system in order to accommodate Ford's expansive growth. 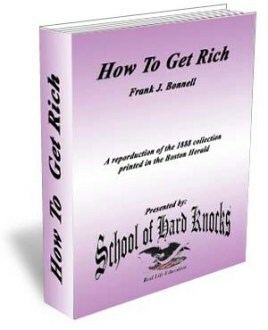 The pages were written to the Boston Herald in response to requests sent out to noted successful men of wealth, and were printed in the columns of that paper. and is striving in one way or another to acquire it." These letters are from men who have successfully wooed the "fickle goddess," and are able and willing to give points to others who wish to do like wise. They are prefaced by short biographical sketches of the authors, which are of value in themselves, as showing how life's battles have been fought and won by men who at the outset had only ordinary opportunities. The Art of Money Getting or The Golden Rules For Making Money is P.T. Barnum's Classic Masterpiece about Money. If you are in Marketing or Advertising, You Should Not Be Without this Book! P. T. Barnum's money making skills are expressed in humorous yet factual terms. He teaches people how the right vocation can lead to great success. Personal habits such as positivism, persistence, perseverance, determination and care for the comfort of others are treated as positive traits.